Mumbai: The Union ministry of finance has set up a working group to study and suggest changes to the legal and regulatory framework on foreign portfolio investments, it said in a statement Tuesday. The committee will also study rules and regulations relating to foreign institutional investors (FIIs), non-resident Indians, and venture capital and private equity investors. The committee will be headed by U.K. Sinha, chairman and managing director, UTI Asset Management Ltd, the fourth largest mutual fund manager in India. 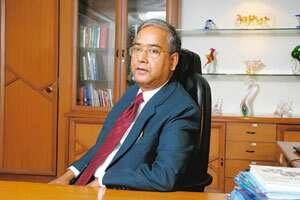 Ravi Narain, chairman of National Stock Exchange Ltd, economist Ajay Shah, finance ministry official K.P. Krishnan and corporate lawyers Bahram Vakil and Somasekar Sundaresan will be part of the 16-member group. The group will review and suggest rationalization of policy on foreign inflows with a view to encourage foreign investment and reduce hurdles while maintaining know your customer norms. It will identify challenges in meeting financing needs of the Indian economy through foreign investments. Currently, foreign capital flows come in through foreign direct investment (FDI), FIIs and foreign venture capital investment, with different rules for each. While some sectors have been fully opened up to FDI, there are caps on others such as insurance and retail. The government has also prescribed maximum investment levels under the different routes. Foreign investors, though, have often used loopholes to exceed limits by registering a sub-account with markets regulator Securities and Exchange Board of India, and buying shares of Indian companies in excess of FDI limits. Although legal, it defeats the purpose of the limits. The group will also study participatory notes and re-examine the taxation of transactions through securities transaction tax and stamp duty.